Background: Environmental risk assessment (ERA) is imperative for commercial release of insect resistant, genetically modified crops (IR-GMCs).An insect specific, spider venom peptideω-HXTX-Hv1a (Hvt) was successfully expressed in cotton plants. The cotton plants producing Hvt protein have demonstrated resistance against economically important insect pest species. The study was performed to assess the effects of Hvt producing cotton plants on Honey bees (Apis mellifera). Methods: Three approaches were used to evaluate the effects of Hvt protein on adults of honeybees; whole plant assays in flight cages, in vitro assays with pollen of Hvt-cotton, and assays with elevated levels of purified Hvt protein. Pollens of Bt cotton or purified Bt proteins were used as control. Results: The field experiments did not yield any meaningful data due to high rate of mortality in all treatments including the control. However, the laboratory experiments provided conclusive results in which Hvt, purified or in pollens, did not affect the survival or longevity of the bees compared to the control. During the course of study we were able to compare the quality, effectiveness and economics of different experiments. Conclusions: We conclude that Hvt either purified or produced in cotton plants do not affect the survival or longevity of honey bees. We are also of the view that starting at laboratory level assays not only gives meaningful data but also saves a lot of time and money that can be spent on other important questions regarding safety of a particular transgenic crop. Hence, a purpose-based, tiered approach could be the best choice for pre-release ERA of IR-GMCs. Commercial release of insect resistant genetically modified crops (IR-GMCs) has been one of the most important advances in agricultural biotechnology . According to estimates, by 2015, cultivated area under GM crops had reached to 179 million hectares in 28 countries . IR-GMCs provide a number of benefits, such as decreased need for chemical insecticides, improved yield, lower production costs and compatibility with the host environment [3-5]. Owing to reports of reduced efficacy and resistance against cry proteins [6,7], the efforts to find novel insect resistant proteins continues. Recently transgenic cotton and tobacco plants producing synthetic version of a spider venom peptide ω-HXTX-Hv1a (Hvt) have been developed. These transgenic plants have demonstrated resistance against economically important insect pest species such as Helicoverpa armigera, Heliothis virescens, Spodoptera littoralis and others [8,9]. This study was a part of pre-release risk assessment of transgenic cotton producing Hvt. Hvt is a 37 amino acid peptide from an Australian funnel-web spider, Hadronyche versuta , and has been effective against many commercially important insects of different orders including Orthoptera, Coleoptera, Lepidoptera and Diptera [11-15]. The emphasis was to evaluate the effects on non-target arthropods (NTAs). They include beneficial species that contribute via biological control, pollination or decomposition of organic materials [16,17]. For the selection of NTA species one should consider, the accessibility of facilities and expertise to rear and maintain the species in controlled conditions, and the availability of valid and recognized laboratory test protocols [16,18]. The representative species of NTAs, selected on the basis of above mentioned factors, are referred to as surrogate species . We used honeybees, Apis mellifera (Hymenoptera: Apidae) as surrogate species because, their products have a strong ecological, medicinal and economic importance in rural culture of South Asia, and have been associated with increased production of many crops . Honey bees have also been used as model for toxicity studies and environmental risk assessment of biological and chemical substances [21,22]. They are commercially available and reared mostly for honey production in Pakistan. At the problem formulation stage we were struck between so many diverse options regarding risk assessment approaches that were being used to evaluate potential hazards of GMCs. We had three approaches on the table; a) whether we should test the whole plants; b) the part of the plant that the test non-target arthropod consumes as a food (e.g. pollen),and c) the novel trait (Hvt protein) that has been expressed in the transgenic plants. These three approaches complemented three test hypotheses; i) transgenic cotton line producing Hvt protein are substantially equivalent to its near-isogenic, non-transgenic line; ii) the nutritional value of pollens produced by the Hvt-transgenic cotton line was not significantly different as compared to the pollens produced by its near-isogenic, non-transgenic line; and iii) Hvt protein have no detrimental effect on the survival and longevity of the A. mellifera adults. Literature supporting all these approaches was available and every approach had merits and demerits of its own. Thus, we tested all three approaches, and drew conclusions on the basis of the quality and robustness of results. We also compared economics of all the approaches, as it is one of the most crucial factors while designing risk assessment strategy for countries with trifling economies in Asia and Africa. Seeds of transgenic cotton (Gossypium hirsutum L.) line T-7 expressing the spider venom toxin gene ω-HXTX-Hv1a (Hvt) under the control of a constitutive 35S promoter Cauliflower Mosaic Virus (CaMV) and its near isogenic, non-transgenic cotton line Presence of Hvt gene was confirmed by Polymerase Chain Reaction (PCR) and 137 bp gene was amplified, using event specific primers (Forward: 5'-TAC GTA ATG TCA CCA ACT TGC AT-3': Reverse: 5'-GCG GCC GCT TAA TCG CAT CTT TT-3'). PCR conditions were 95 ºC for 5minutes, 95 ºC for 30 seconds, 59 ºC for 30 seconds, 72 ºC for 1 minute and 72 ºC for 5 minutes. PCR product was detected by electrophoresis on 2% agarose gel along with 50 bp DNA ladder (GeneRuler™, Fermentas). Transgenic Bt-cotton producing Cry1Ac protein was used as known control. Seeds of Bt-cotton line IR-1524, and it’s near isogenic, non-transgenic line were used. This variety produces Cry1Ac protein (Mon531 event) up to 676.59ng g-1 of fresh leaf . Presence of Mon-531 event was confirmed by performing PCR on genomic DNA of individual plants using event specific primers; Forward 5’-CAAAGGAGCCTGTTCA-3’ and Reverse 5’-TGAGGTGAGTCAGAATGTTGTTC-3’ . PCR conditions followed the method of Yang et al. (2005). The plants were grown in NIBGE experimental fields (either open or in cages) in years 2009 and 2010 in normal cotton growing season. Separate colonies were purchased at the time of each experiment. In total five colonies of A. mellifera were used at different times, as the need arose. Each colony contained about 5000-6000 workers and a fertile, 1-year old queen. Honeybee colonies were maintained in the form of hives, each hive had 5 combs, 2 combs containing brood, 2 with honey, while 1 comb was left empty for emerging brood and food storage purposes. In each hive, the combs were positioned near the center of the box, separated by a division board. These colonies had been provided with standard sanitary treatments and had not been treated with any chemical whatsoever for at least 30 days before commencing the experiments. In addition to nearby flowering crops, 40% sugar solution was provided as a constant supply of food, filled in bowls placed near the hives. To assess the effects of transgenic plants on development of honey bees, semi-field assays were performed in 2010. Our vision at the time was to observe bees in close to natural environment over a longer period of time. We wanted to observe any visible unintended change in the behavior of bees in response to transgenic plants. For example, what would be the effect on their foraging behavior; would they like transgenic plants equally as compared to the non-transgenic; would they be able to survive on transgenic plants as long they do on the non-transgenic; what is the effect on fecundity and quality of honey produced by the bees. The plants were grown in three plots A, B & C (3m x 10m), in south-north direction. Plot A grew only the non-transgenic cotton (two rows of non-Bt and two rows of non-Hvt, assuming that the genetic backgrounds of the cotton varieties were similar), plot B received only Hvt- cotton plants, while plot C grew only the Bt-cotton plants. At the beginning of flowering stage (50 days after emergence) each plot was turned into a flight cage (3m x 10 m, 3m high at the center and 2m at the sides). The cage structure made with iron pipes was installed around the plots, and then it was covered with a green cloth having a mesh size 2mm x 2mm. The setup we constructed was inspired by the study of Decourtye et al. . It created an environment close to field conditions, at least in theory. One colony of honeybees (A. mellifera) was placed in each cage in the evening, so that all the bees might have returned to the colony. A bowl of 40% sugar solution was placed near the hive as a constant food supply. The data for mortality and foraging behavior of honey bees was recorded daily. Dead bees were counted and removed from each cage in the evening. The entire laboratory assays were performed in control condition at 25±2 °C, 70±5% RH, and a 16 h photoperiod. Pollens of transgenic and their respective non-transgenic cotton lines (planted in field) were collected with the help of camel hair brush in Petri-dishes, in the morning hours. Petri dishes containing fresh pollens were carefully labeled, transported to the laboratory and stored at -20 until use. To assess the effect of transgenic pollens, newly emerged honeybees (<48 h) were separated from the colony. A group of 10 bees was placed in clear plastic boxes (15 cm diameter, 20cm height). The bees were fed with 2M sucrose solution containing pollens of non-transgenic cotton (control), or Hvt cotton, or pollens of Bt-cotton expressing Cry1Ab. Pollen of non-transgenic cotton mixed with 2M sucrose solution of Triazophos 6.7µg mL-1 was used as positive control. The amount of pollens in all treatment was 0.16 g mL-1. The methodology followed was a modified form of that used by Liu et al. (2005). The supply of food solutions in the experimental arenas was regularly monitored and was replenished every 1-2 days. The solutions were always renewed before complete consumption of the previous dose. Data was collected every 24 h, dead honey bees were counted, recorded and removed from the boxes. Each treatment began with at least three replicates (plastic boxes)/ thirty bees. Laboratory assays were performed to assess the effects of purified proteins on the survival and longevity of honeybees. New emerging bees were separated from the colony, and a group of 10 bees was placed in clear plastic boxes (15 cm diameter, 20 cm height). They were subsequently, provided with food solutions containing 0.5 M sucrose and different concentrations of Hvt (0, 40 µg mL-1), Cry2Ab2 (10 µg mL-1) or Potassium arsenate (0.5 g mL-1). As a favorite source of protein for honey bees, pollens of non-transgenic cotton were added to every food solution at the rate of 0.16 g mL-1, as described by Liu et al . Cages: in first experiment the amount spent on construction of green houses and in 2nd and 3rd experiment amount spent on plastic boxes. Bees: The amount spent on purchase of honeybee colonies and sucrose to feed them. Sowing: In experiment 1 and 2, amount spent on the land preparation and sowing of seeds. Labor; the amount spent on labor was calculated as per hour, multiplied by the total number of hours spent in each experiment. In experiment 1 and 2 field crop was required to maintain for four months. The labor was required for sowing, watering, manure application and data collection. On an average 2 hours of labor was required each day. All the expenses were calculated in Pakistani rupees (PKR). Kaplan-Meier procedure and Log-rank test were used to compare the survival responses of adult A. mellifera. Chi-square (χ²) Analyses and t-test were performed for comparison of means. All the statistical analyses were performed with computer software SPSS (version 16, IBM Corporation, Armonk, NY, USA). The whole plant, semi-field assays failed to provide any meaningful data. A large number (>500) of honey bees died every day in both the transgenic as well as the control plots. High mortality in the control meant the data were not conclusive for risk assessment purpose. The mortality of bees was mainly due to collision with the net on the eastern and southern side of the sheds. We observed that the bees wanted to fly towards the rising sun in the morning and collided furiously to the net and fell down dead. It was a shocking discovery. We discontinued the experiment after 5 days in which almost 75 % of the bees died, clearly due to collision with the netting cloth. The mortality was evenly distributed among all the treatments. The effects of transgenic pollen producing Hvt or Cry1Ac were assessed on survival of worker bees of A. mellifera. Fig. 1 shows percent survival of A. mellifera adults along the time. The survival pattern in any of the treatments was not significantly different from the control (non-transgenic pollen+2M sucrose solution). The pollens of transgenic cotton lines (containing either Hvt or Cry1Ac) had no effect on the survival of worker bees, (Log-Rank test =0.785, P = 0.376). Mean life (longevity) in the control treatment (non-transgenic pollen 0.16g mL-1 mixed in 2M sucrose solution) was 293.42±35.36 h (mean±SE), 307.64±28.13h in the Bt-pollen treatment and 282.51±29.73 in the Hvt pollen treatment (0.16 g mL-1) (Fig. 2). All the worker bees fed with the Triazophos 6.7µg mL-1 mixed with 2M sugar solution and non-transgenic pollen died within 24 hours. 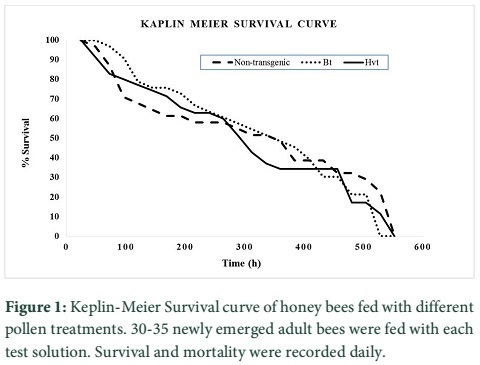 The effect of purified Hvt (40 µg mL-1) and Cry2Ab2 (10 µg mL-1) on longevity and survival of worker bees of A. mellifera was assessed. The survival pattern in any of the treatments was not significantly different from the control (2 M sucrose solution). All the worker bees fed with potassium arsenate (positive control) died within 24 hours. The results of the assays with purified proteins, along with several other assays performed with target and non-target arthropods have already been published . The expenses incurred on each experiment varied considerably from each other. 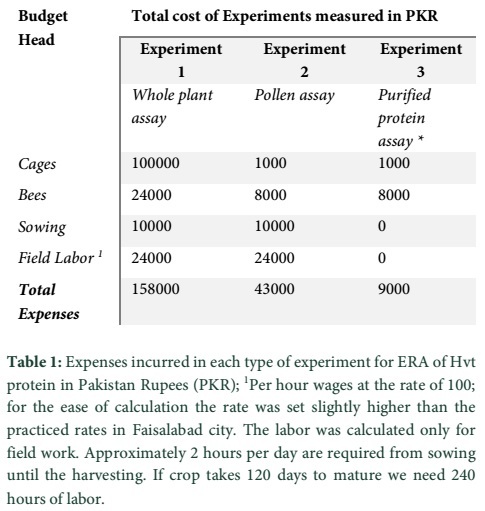 In experiment 1, a sum total of about PKR.158000, (USD1580) used on the experimental setup, and purchase and maintenance of honeybee colonies. In the second experiment performed with pollens of transgenic cotton varieties, a sum total of PKR. 43000 (USD430) incurred, it is 3.58 times less than the expenses incurred in the first experiment. While, in the 3rd experiment, performed with purified proteins, the expenses came to be merely PKR. 9000 (USD90) (Table 1), a humongous 17.11 times less than that incurred on the first experiment, and 4.77 times less than the second one. Environmental concerns remain one of the biggest limitations for development, commercial release and worldwide acceptance of novel GM crops . One has to analyze the toxicity of a particular insecticidal protein to NTAs along with the level of exposure expected in field conditions [16,26,27]. Whole plant assays were performed to see any visible effect of transgenic cotton lines on the feeding behavior of honey bees. The rationale behind this experimental design was to provide conditions as close to field as possible. We included actual plantation in to the flying arena instead of the pollen only method of Decourtye et al. . However, the parameters we wanted to record were slightly different from them, as they were mainly interested in studying changes in olfactory learning behavior patterns of honey bees in response to different insecticides. The dimensions of flying arena we provided to the bees were significantly bigger than that of the Decourtye et al. , who used ﬂight cages with dimensions of 2.5m x 2.5m, 2m height. The biggest physical drawback of field assay was the poor control over environmental conditions e.g. temperature, humidity, light and precipitation. The flowering season of cotton plants coincides with the most humid months of the year in Pakistan. The humidity inside the flight cages was at times more than 90%. This elevated humidity, combined with high temperatures, more than 35 ˚C at noon, is troublesome for honeybees. The rate at which honeybees died was alarming. Within a week of experiment we lost almost 80% of the bees in every treatment and the remaining became sick. They could not regain their population after being placed even in open field outside the flight cages, and did not survive very long. We are also of the view that it is relatively difficult to monitor the clear toxicity endpoints in open field experiments. The results drawn from such an experiments would be less robust and are unlikely to be reproduced in another experiment . There are other open field methods to expose honeybees to transgenic plants. For example, Huang et al. placed bee hives in large plantations of transgenic and non-transgenic canola crop for the study of population dynamics and behavior of bees . Such experiments are expensive and time consuming for a risk assessment purpose. Such experiments are also vulnerable to environmental stresses as well, and involve a considerable environmental risk if the transgenic protein is actually hazardous. Perhaps, such experiments can be considered as a part of post-release monitoring program . Honeybees consume pollens as an important source of protein. Therefore, experiments were performed on newly emerged (<48 h old) worker bees, and were fed with pollens of transgenic cotton (Hvt and Bt). Survival and longevity of the bees fed on transgenic pollen was statistically similar to that of the control. Hence, we can safely assume that the nutritional value of Hvt as well as Bt pollen is same as that of the pollen of non-transgenic cotton lines. There were no observable, unintended changes in the nutritional composition of the transgenic pollen. Literature proposes that the level of transgenic protein produced in pollen is extremely lower compared to that in other parts, usually [29,30]. Furthermore, the concentration of transgenic protein varies significantly depending upon the nature of the transgenic protein, crop specie and genetic background of the variety of a particular crop, and many other physiological and environmental factors [31-39]. There are other methods of exposing adults or larvae of honeybees to the pollen of transgenic plants. For example mixing the pollen in honey or sugar to form a cake/ candy, and place it inside the hive [40,41]. However, such experiments require very sophisticated set of skills, expertise and equipment regarding data collection, handling and rearing of honeybees. Therefore, the most appropriate method for toxicological studies comes to be the assays with elevated levels of purified protein instead of using parts of a transgenic plant. While performing artificial-diet bioassays, the most important aspect to be considered is the amount of protein to be fed to the non-target arthropods. Honeybees were fed Hvt protein at 40 µg mL-1, significantly higher amount than the LC95 value for the target insect pests of Hvt, Spodoptera littoralis and Heliothis virescens (Lepidoptera; Noctuidae). 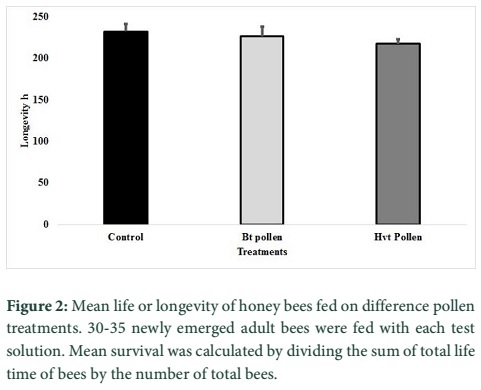 No adverse effects were found on the survival and longevity of honeybees fed on Hvt . In a recent study, Nakasu et al., (2014) reported similar results. They reported only small effect on survival of adults by ingestion (LD50. 100 mg bee-1) or injection of fusion protein. Bees fed acute (100 mg bee-1) or chronic (0.35 mg ml-1) doses of Hv1a/GNA, and trained in an olfactory learning task, had similar rates of learning and memory to no-pesticide controls. The larvae of honeybees were also unaffected by Hv1a/GNA, and were able to degrade this protein after ingestion . Apart from A. mellifera, we were able to perform non-target assays with Chrysoperla carnea (Neuroptera: Chrysopidae), Coccinella septempunctata (Coleoptera: Coccinellidae) and Aphidius colemani (Hymenoptera: Aphidiidae). Both the proteins Hvt (10, 40 µg mL-1) or Cry2Ab2 10µg mL-1, did not adversely affect any of the life-table parameters of C. carnea, C. septempunctata or A. colemani . The experiments with purified Hvt protein included a treatment of purified Cry2Ab2 as a known standard. It did not show any harmful effects on studied parameters of the non-target arthropods. Our results are similar to most of the previous reports about the safety of Bt proteins and pollen producing them [35,36,43-45]. The comparison between the expenses incurred on different experiments showed that laboratory assays are the most suitable in financial terms. They not only give reliable, interpretable results but also save money, time and space resources. For example, after the non-significant results obtained from assays with C. septempunctata, C. carnea and A. colemani  we do not need any field or semi-field assays. In theory, starting with purified protein assays saved us close to half a million PKR. The only expenses are maintaining the insect populations in laboratory that vary on a case by case basis. The cost of laboratory instruments and provision of control conditions were not included in expenses, as they were already available in the institute. Similarly, expenses incurred on protein purification were provided by the developers of the GM plants. In terms of time, the experiments with A. mellifera took almost four years to be planned, optimized and get meaningful data. While, experiments with other three non-target arthropods took only a year. The time for protein purification and optimization of assays is also included in that year. The expenses would soar up to another level if the total time and the used space are also assigned monetary values. Hvt protein purified or produced in plants has no adverse effect on survival or longevity of adult honey bees. Furthermore, purpose-based, tiered-risk-assessment approach is the best choice for pre-release risk assessment studies. Risk assessment strategy should begin with conventional laboratory-based toxicity tests (lower tiers) where NTA are exposed to high concentrations of purified test insecticidal proteins [16,26]. Such studies increase the likelihood of identifying any adverse effect of the insecticidal proteins on NTAs. If no adverse effects are observed under the worst-case exposure conditions the risk is considered as being tolerable or negligible. Thus, there is no need to conduct higher tier testing as there is minimum probability of adverse effects in the field conditions where NTAs are exposed to far lower levels of the insecticidal proteins [26,27,46].The methods may vary but starting at laboratory level assays gives most reliable results. In addition, fit for purpose approach saves invaluable time, and a lot of money that can be spent on other important questions regarding biosafety of GMCs. 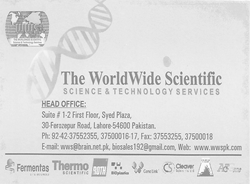 We are thankful to Dr. Zahid Mukhtar for providing culture of transgenic E.coli, and seeds of Hvt-cotton. We also thank Dr. Jörg Romeis, Leader Biosafety group at Agroscope, Institute of Sustainability Sciences ISS Zurich in Switzerland for mentoring Dr. Inaam Ullah during his stay. Funding for this study was provided by Higher Education Commission (HEC), Pakistan. Ferry N, Edwards MG, Gatehouse J, Capell T, Christou PAMR, et al. Transgenic plants for insect pest control: a forward looking scientific perspective. Transgenic Research, (2006); 15(1): 13-19. James C. 20th Anniversary (1996 to 2015) of the Global Commercialization of Biotech Crops and Biotech Crop Highlights in 2015. ISAAA Brief, (2015); (51). Thubru D, Firake D, Behere G. Assessing risks of pesticides targeting lepidopteran pests in cruciferous ecosystems to eggs parasitoid, Trichogramma brassicae (Bezdenko). Saudi Journal of Biological Sciences, (2016). Ronlels J, Meissle M, Raybould A (2009) Ground Non-target Arthropods. Environmental impact of genetically modified crops. Wallingford: CABI. pp. 165. Shahid AA, Bano S, Khalid S, Samiullah TR, Bajwa KS, et al. Biosafety assessment of transgenic Bt cotton on model animals. Advancements in Life Sciences, (2016); 3(3): 97-108. Tabashnik BE, Brévault T, Carrière Y. Insect resistance to Bt crops: lessons from the first billion acres. Nature Biotechnology, (2013); 31(6): 510-521. Nair R, Kamath SP, Mohan KS, Head G, Sumerford DV. Inheritance of field‐relevant resistance to the Bacillus thuringiensis protein Cry1Ac in Pectinophora gossypiella (Lepidoptera: Gelechiidae) collected from India. Pest Management Science, (2016); 72(3): 558-565. Khan SA, Zafar Y, Briddon RW, Malik KA, Mukhtar Z. Spider venom toxin protects plants from insect attack. Transgenic Research, (2006); 15(3): 349-357. Ullah I, Hagenbucher S, Álvarez‐Alfageme F, Ashfaq M, Romeis J. Target and non‐target effects of a spider venom toxin produced in transgenic cotton and tobacco plants. Journal of Applied Entomology, (2015); 139321–332. Fletcher JI, Smith R, O'Donoghue SI, Nilges M, Connor M, et al. The structure of a novel insecticidal neurotoxin, ω-atracotoxin-HV1, from the venom of an Australian funnel web spider. Nature Structural Biology, (1997); 4(7): 559-566. Mukherjee AK, Sollod BL, Wikel SK, King GF. Orally active acaricidal peptide toxins from spider venom. Toxicon, (2006); 47(2): 182-187. Smith JJ, Herzig V, King GF, Alewood PF. The insecticidal potential of venom peptides. Cellular and Molecular Life Sciences, (2013); 70(19): 3665-3693. Pal N, Yamamoto T, King GF, Waine C, Bonning B. Aphicidal efficacy of scorpion and spider derived neurotoxins. Toxicon, (2013); 70; 114-122. King GF, Hardy MC. Spider-Venom Peptides for Control of Insect Pests. Annual Review of Entomology, (2013); 58(1): 475–496. Windley MJ, Herzig V, Dziemborowicz SA, Hardy MC, King GF, et al. Spider-venom peptides as bioinsecticides. Toxins, (2012); 4(3): 191-227. Romeis J, Bartsch D, Bigler F, Candolfi MP, Gielkens MMC, et al. Assessment of risk of insect-resistant transgenic crops to non-target arthropods. Nature Biotechnology, (2008); 26(2): 203-208. Sanvido O, Romeis J, Bigler F (2007) Ecological impacts of genetically modified crops: ten years of field research and commercial cultivation. Green Gene Technology. pp. 235-278. Dutton A, Romeis J, Bigler F. Assessing the risks of insect resistant transgenic plants on entomophagous arthropods Bt-maize expressing Cry1Ab as a case study. BioControl, (2003); 48(6): 611-636. Caro TM, O'Doherty G. On the use of surrogate species in conservation biology. Conservation Biology, (1999); 13(4): 805-814. Partap U (2011) The pollination role of honeybees. Honeybees of Asia: Springer. pp. 227-255. Liu B, Xu CR, Yan F, Gong R. The impacts of the pollen of insect-resistant transgenic cotton on honey bees. Biodiversity and Conservation, (2005); 14(14): 3487-3496. Decourtye A, Devillers J, Cluzeau S, Charreton M, Pham-Delègue M-H. Effects of imidacloprid and deltamethrin on associative learning in honeybees under semi-field and laboratory conditions. Ecotoxicology and Environmental Safety, (2004); 57(3): 410-419. Ullah I, Asif M, Arslan M, Ashfaq M. Temporal expression of Cry1Ab/c protein in Bt-cotton varieties, their efficacy against Helicoverpa armigera (Lepidoptera: Noctuidae) and population dynamics of sucking arthropods on them. International Journal of Agriculture and Biology, (2014); 16(5): 579-585. Yang L, Pan A, Zhang K, Yin C, Qian B, et al. Qualitative and quantitative PCR methods for event-specific detection of genetically modified cotton Mon1445 and Mon531. Transgenic research, (2005); 14(6): 817-831. Gray A. Problem formulation in environmental risk assessment for genetically modified crops: a practitioner’s approach. Collection of Biosafety Reviews, (2012); 610-65. Romeis J, Hellmich RL, Candolfi MP, Carstens K, De Schrijver A, et al. Recommendations for the design of laboratory studies on non-target arthropods for risk assessment of genetically engineered plants. Transgenic Research, (2011); 20(1): 1-22. Garcia-Alonso M, Jacobs E, Raybould A, Nickson TE, Sowig P, et al. A tiered system for assessing the risk of genetically modified plants to non-target organisms. Environmental Biosafety Research, (2006); 5(2): 57-65. Raybould A. Ecological versus ecotoxicological methods for assessing the environmental risks of transgenic crops. Plant Science, (2007); 173(6): 589-602. Kranthi KR, Naidu S, Dhawad CS, Tatwawadi A, Mate K, et al. Temporal and intra-plant variability of Cry1Ac expression in Bt-cotton and its influence on the survival of the cotton bollworm, Helicoverpa armigera (Hubner) (Noctuidae: Lepidoptera). Current Science, (2005); 89(2): 291. Adamczyk JJ, Adams LC, Hardee DD, Dugger P, Richter D. Quantification of Cry1A (c) δ-endotoxin in transgenic Bt cotton: correlating insect survival to different protein levels among plant parts and varieties; 2000 4-8 January; San Antonio, USA. National Cotton Council. pp. 929-932. Hendriksma HP, Küting M, Härtel S, Näther A, Dohrmann AB, et al. Effect of stacked insecticidal Cry proteins from maize pollen on nurse bees (Apis mellifera carnica) and their gut bacteria. PloS One, (2013); 8(3). Li Y, Zhang X, Chen X, Romeis J, Yin X, et al. Consumption of Bt rice pollen containing Cry1C or Cry2A does not pose a risk to Propylea japonica (Thunberg)(Coleoptera: Coccinellidae). Scientific Reports, (2015); 5: 7679. Li Y, Meissle M, Romeis J. Consumption of Bt maize pollen expressing Cry1Ab or Cry3Bb1 does not harm adult green lacewings, Chrysoperla carnea (Neuroptera: Chrysopidae). PloS One, (2008); 3(8): e2909. Huang ZY, Hanley AV, Pett WL, Langenberger M, Duan JJ. Field and semifield evaluation of impacts of transgenic canola pollen on survival and development of worker honey bees. Journal of Economic Entomology, (2004); 97(5): 1517-1523. Dai PL, Zhou W, Zhang J, Cui HJ, Wang Q, et al. Field assessment of Bt cry1Ah corn pollen on the survival, development and behavior of Apis mellifera ligustica. Ecotoxicology and Environmental Safety, (2012); 79: 232-237. Han P, Niu CY, Biondi A, Desneux N. Does transgenic Cry1Ac+ CpTI cotton pollen affect hypopharyngeal gland development and midgut proteolytic enzyme activity in the honey bee Apis mellifera L.(Hymenoptera, Apidae)? Ecotoxicology, (2012); 21(8): 2214-2221. Adamczyk JJ, Meredith WR. Genetic basis for variability of Cry1Ac expression among commercial transgenic Bacillus thuringiensis (Bt) cotton cultivars in the United States. Journal of Cotton Science, (2004); 817-23. Adamczyk JJ, Sumerford DV. Potential factors impacting season-long expression of Cry1Ac in 13 commercial varieties of Bollgard® cotton. Journal of Insect Science (Tucson), (2001); 1(13): 1-6. Dong HZ, Li WJ. Variability of endotoxin expression in Bt transgenic cotton. Journal of Agronomy and Crop Science, (2007); 193(1): 21-29. Standifer L. Honey bee nutrition and supplemental feeding. Beekeeping in the United States Agriculture Handbook, (1980); 33539-45. Somerville D. Honey bee nutrition and supplementary feeding. Agnote DAI/178 NSW Agriculture, (2000); 1034-6848. Nakasu EYT, Williamson SM, M ME, Elaine FM, John GA, et al. Novel biopesticide based on a spider venom peptide shows no adverse effects on honeybees. Proceedings of the Royal Society of London Series B: Biological Sciences, (2014); 281: 20140619. Dai P-L, Zhou W, Zhang J, Jiang W-Y, Wang Q, et al. The effects of Bt Cry1Ah toxin on worker honeybees (Apis mellifera ligustica and Apis cerana cerana). Apidologie, (2012); 43(4): 384-391. Ramirez-Romero R, Chaufaux J, Pham-Delegue M. Effects of Cry1Ab protoxin, deltamethrin and imidacloprid on the foraging activity and the learning performances of the honeybee Apis mellifera, a comparative approach. Apidologie, (2005); 36(4): 601. Hanley AV, Huang ZY, Pett WL. Effects of dietary transgenic Bt corn pollen on larvae of Apis mellifera and Galleria mellonella. Journal of Apicultural Research, (2003); 42(4): 77-81. Alvarez-Alfageme F, Bigler F, Romeis J. Laboratory toxicity studies demonstrate no adverse effects of Cry1Ab and Cry3Bb1 to larvae of Adalia bipunctata (Coleoptera: Coccinellidae): the importance of study design. Transgenic Research, (2011); 20(3): 467-479. Ullah I, Asif M, Ranjha MH, Iftikhar R, Ullah M, Khan NM, Ashfaq M (2017). Biosafety risk assessment approaches for insect-resistant genetically modified crops. Adv. Life Sci. 4(2): 39-46.